Hotel was sold as a 4* but I don’t think its correct maybe a 3*. The room was very clean, a little dated but ok for the cost. We chose the all inclusive package and were very disappointed with all the meals and drinks on offer and would not recommend eating there at all, very poor quality and very little choice. Hotel tip: Good location but self catering is the way to go and there is a supermarket close by. We stayed in this hotel before, and revisited. I must say that the hotel cleanliness has really gone down, our room was quite shabby, and the curtains even had holes in them, so we knew when it was morning when we could see the light reflecting through the holes in the curtains. The location however is fantastic, very quiet away from the strip but easy walk either from the front of the hotel or take the walk from the rear to the strip. Our room was only cleaned once in the week we were there, so room cleanliness was very poor, hotel staff were friendly enough if you were a long stay holiday maker, but not so friendly to the basic holiday maker. I would not visit this hotel again as I thought that it had completely gone downhill, and was really shabby. 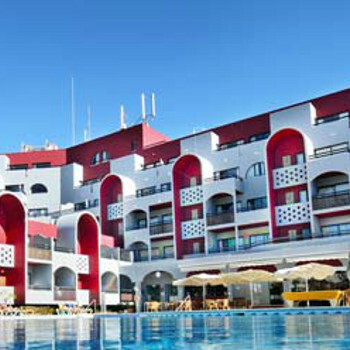 We love the Algarve and will be revisiting, but not to this hotel. booked the cpo and was placed in the oura praia. Hotel spotless and apt well equipped. Was unfortunate to be located on the second floor rm 218 above a chippy and a karaoke bar, which kept my children up until approx 3am. Numerous complaints were made to the management and the Thomas Cook rep who was completely useless and more or less said I would have to sort it out myself!!! The reception staff could not have been more rude if they had tried , with the exception of one person, thought we should be grateful that we had been placed in a 4 star hotel!!!!! after a week of pure hell, due to lack of sleep was given a room on the 5th floor. would not recommend anyone book the cpo / oura praia if you have small children as you could well end up with a room on the side that we did, rm 214 to aprox rm 222. Having stayed in the CPO for the last 6 years was a little disappointed to be told we were in the Oura Praia but we a had very plesant surprise. The rooms were large are airy with a balcony covering both the lounge and bedroom, air conditioning, very large bathroom and bedroom with plenty of storage. The room was above the bars/cafes on the street but there was no noise at all after midnight. Staff very helpful giving advice on local bus travel. The hotel sticks by its policy of removing towels from sunbeds if they have been saved and not occupied, which gives everybody an equal chance. Prices for food and drink around the pool are very reasonable and very good. Cannot wait to return, fantastic holiday. We were pleasantly surprised when we arrived to find a large well furnished apartment. It had recently been reburbished with a new kitchen area, microwave, fridge freezer, adequate cutlery crockery etc. Balcony had sun all day but lacked loungers to take advantage of this. Flat screen tv with a handful of uk chanels. Downside was the appauling noise from the bar below...we were in room 220 and were kept awake after 0300 for 3 nights with disturbances from the bar in the street under the hotel. I challenged the revellers but got only abuse (they were English of course.) The couple in the room at the side of us, 221, were French and resorted to throwing water over the offenders. This was met by torrents of abuse inclusing "We'll come up ther and smash your F*****ng door down" Come on hotel ownership....get to grips with this and you'll have a great place. Don't spoil the Algarve.....it's great. We have been to the Ourapraia many times over the years and also the Cpo(Clube praia da oura) on several occasions.i much prefer the OPH as its quieter and has air con in the rooms. Both the OPH and the CPO are situated away from the noisy strip but within a 10 minute walk. There are a number of small friendly bars/cafes under the hotel as well as a large cheap supermarket.Fresh bread rolls every morning and with ham and cheese from the deli counter at just over 1 euro for 6 slices of each makes me a very happy boy! Cans of beer sell for 47 cents...again another reason to smile!! We have never had a problem with the cleanliness of the hotel although the satellite tv is rubbish(bbc1/sky news and eurosport..the rest were foreign)but the rooms are spacious and well equipped.The pool is a good size but always very cold..but you can't have everything. Staff can be a bit sour faced but just joke a bit with them and you might just get a smile. we have stayed in both cpo and ouria priara 4 times in the last 10 years and always enjoy it. we favour oura priara hotel now the children are older as it is closer to the strip, but if youre looking for kids entertainment and daytime pool activities then cpo is your best place.the hotel grounds are spotless and the hotel room is cleaned every other day, however the your bins are emptied daily. we find the staff are very helpfull and food great especially their baco breakfasts(poolside).the glasses arent plastic as long as you drink at the poolside bar which is very relaxing, as most hotels use plastic glasses even if youre sat at the bar. the night entertainment gang are very friendly also and do their best. We had booked for a Christmas break after staying at CPO previously. I emailed the hotel a week before going specifically requesting CPO , as its definitely better positioned for children, however, on an almost full bus going there we were the only party to be put in the hotel -we were absolutely gutted. The hotel has no view whatsoever, its on a loud street, above a supermarket overlooking a few bars. The room we were originally given wasn't clean enough - I bought 2 bottles of bleach to clean toilet but it smelt disgusting. We also had no heating for 2 days, despite several requests to fix it or move us. Reception (who are the most arrogant lot I have ever met - with the exception of 1 lady) refused to move us for several days, they then offered us an apartment which was in a block down the road from CPO, this was almost in middle of woods - with metal grille shutters for safety - erm no thanks. After 3 days of requests we were given a top floor apartment with same ugly view, but at least it was clean and had heating. Staying on half board is well worth the extra you pay, the evening meals were all waiter service, ordered from a menu - good selection, or you can have any of the carvery or buffet/snack meals they do. Walked to CPO for breakfast, as preferred the buffet there. The entertainment at Christmas and New Year is specifically for the older generation, most were in at least 50s 60s and older. They do a quiz, then some well past it singer does an hour or so warbling. The fireworks at New Year were beautiful, as was the weather for most of the 2 weeks. We were delighted to be allocated to this hotel when we initally arrived at the resort, as we could also have been put in the CPO. We had an excellent room on the top floor with views of both the pool and the sea, hotel room was very clean, spacious and tidy. Beds for once were extremely comfortable in the bedroom, 3rd & 4th beds were the dreaded couch beds which if you had another 2 adults staying I dare say it would have been torture. Room had air conditioning which was a blessing in the July / August heat. Room had adequate crockery etc for a self catering stay, maid service was three times a week with beds being changed once a week (which wasn't enought to be honest). Although, the maid was very approachable if she was on the landing for more towels, toilet rolls etc. We stayed at these apartments in June 2006, we didnt really know what to expect as this was our first time to the algarve. On arrival we were very impressed as the rooms were really spacious, clean and well maintained. Staff were very friendly, and the location was superb only 5 minutes walk from the strip and restaurants. Great atmosphere between locals and english as the world cup had just started. Would recommend getting up early to get a place by the pool, which was spotless. Highly recommend these apartments and would definitley stay there again.